Snowdrops or Milk Flowers. An eastern Mediterranean native, this deer- and rodent-resistant 1875 heirloom is one of the earliest portents of spring. 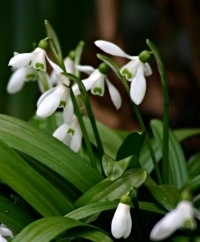 These drooping, milky-white naturalizers have dainty, inner tips of emerald-green. Great in rock gardens, border plantings or naturalized drifts, they are best planted in clusters of ten or more in filtered sunlight. 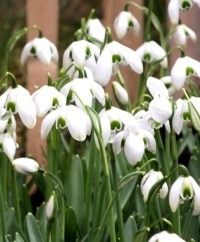 They are more tolerant of soil with a bit of moisture than other bulbs and are quite hardy~they pop right back up after surprise spring snowfalls. Space Galanthus clusters away from emergent summer perennials that could be covered and languish as Galanthus foliage thrives and dies back naturally. March/April. Plant 4" deep and 2" to 4" apart. HZ: 3-8. 5" to 8". 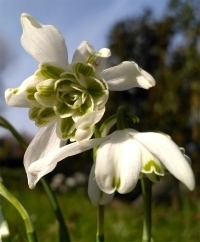 Galanthus are The Art & Soul of Spring.